Get ready for summer by preparing for a job that is challenging, rewarding, and offers the chance to advance! At the completion of this course, successful lifeguard candidates are eligible to be fully licensed through the nationally recognized Jeff Ellis and Associates, Inc. program. 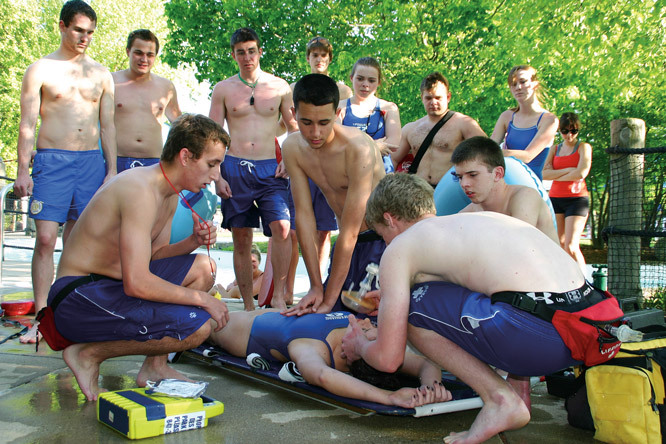 • Course includes water safety and rescue techniques, CPR, first aid, AED certification, and oxygen support training. • Internet access is required in order to complete the book and test portion of this course prior to the class dates. • Completion of this class does not guarantee employment with the Des Plaines Park District. • Successful candidates who require a certificate of completion for employment at another agency will be charged an additional $50 after completion of the program. 15 years of age or older before the course begins. Tread water for 1 minute using legs only. Swim 100 yards continuously (using front crawl or breast stroke), and retrieve a 10 pound brick from a depth of 12 feet and swim to the side. Questions: Contact Matt Hartnett, Aquatics Manager. 847-391-5700 or via email.